Travelling in loose flocks of hundreds of birds, this sociable species will also roost together in trees, but migrate singly or in flocks of less than 50, at altitudes of around 2000 m. The lesser kestrel's flapping flight is shallow and rapid and is more conspicuous to prey than the subtle gliding flight that is more normally used. Hunting, usually for small mammals, makes excellent use of the lesser kestrel's powerful eyesight, sharp claws and strong beak. It dives almost silently from a perch or from mid air and pounces on prey with the claws, before swiftly killing its prey with a bite to the back of the head (2). Breeding takes place between March and May, and eggs are laid, not in nests, but in scraped out depressions in trees. 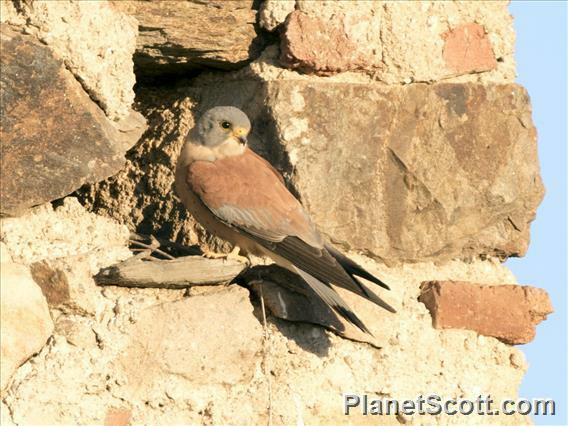 Again, lesser kestrels nest as colonies and pairs will display to each other to strengthen the pair bond. The female invests more time than the male in incubating the four to six eggs she lays, and rearing the chicks when they hatch after 28 – 31 days, but the male will contribute by fighting to defend their territory. The chicks hatch over several days and so the last to hatch is smaller than the others. This individual is most likely to die as it cannot compete effectively for food, and when food is particularly scarce it may be killed and eaten by its siblings. The chicks are fed for two to four weeks, and then must learn to hunt for themselves (2).